Nature has been so benevolent to Mother Earth that she has made the Sun bless its planet with unlimited supply of energy in the form of Solar Energy. It is the Sunrays which heat up the water on earth to form rain clouds and enable the earth to cool itself and make itself again rich in another bounty of nature, namely water. This fundamental and natural manifestation of harnessing nature's abundance in heating water is being suitably and technically synthesized through FLARE UP solar water heaters by SOLAR DEVICES. 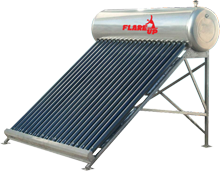 FLARE UP Solar water heaters are made up of collectors and storage tanks. These systems use the Sun to heat water in collectors generally mounted on a roof. SOLAR DEVICES come to your service not only when the Sun shines but after the Sun has set. We offer permanent solution to the perennial problem of power cuts bothering you, by converting & storing solar energy into electricity. 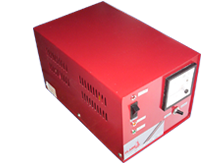 Flare Up Servo Controlled Voltage Stabiliser corrects the heavy fluctuating raw incoming power supply and provides constant stabilized output voltage to equipments with an accuracy of +/- 1%. Solar Electric Power are mainly used to energise our common electric appliances in our office and home.The solar power pack consists of Solar PV modules, long life low maintenance tubular batteries, inverter, charge controller etc. Solar Devices came into being two decades ago as pioneers in the field of electronics and engineering industry. It was a period when the use of non- conventional energy sources was picking up momentum in the country with any and every form of non-conventional energy getting popularized and encouraged. Though India is being subjected to the vagaries of nature, tapping of wind, wave or solar energy, was a matter of choice only depending on the application. And Solar Devices lost no time in jumping on to the utilization of the most reliable, free, clean and renewable form of energy from the eternal source of nature at a time when electricity bills were sky rocketing. When our energy efficient 'Flare Up' started taking shape compactly and aesthetically at our own sheet metal fabrication unit, nightmares about the otherwise rising water-heating bills started becoming misplaced. The name of Solar Devices became synonymous with clean and cheap heat from the green. When we got more and more engrossed in the equipment enabling great saving in water heating bills , we became all the more aware of the havoc played by poor quality electricity and its fluctuations on sophisticated gadgets like computers, computer controlled devices, TV sets, music systems, refrigerators, air conditioners etc. This realization made us venture into the manufacture of SERVO CONTROLLED VOLTAGE STABILISERS. Solar Devices has been providing solar liquid heating systems since 1989. We have numerous installations all over India, using latest technologies in the field of solar thermal energy. We have experience in the design, installation & maintenance of state-of-the-art, environmentally clean, efficient, economical and easy to maintain small to large capacity solar water heaters for domestic, commercial and industrial purposes. Our after sales service department is well equipped and we provide prompt service on any occasion. 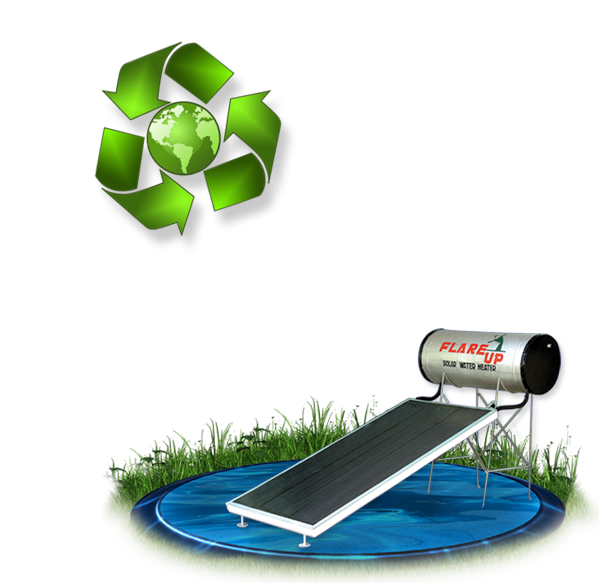 FLARE UP Solar water heaters are made up of collectors and storage tanks. These systems use the Sun to heat water in collectors generally mounted on a roof. The heated water is then stored in a tank similar to a conventional gas or electric water tank. Sturdy & weather proof design. Onsite after sales and service. 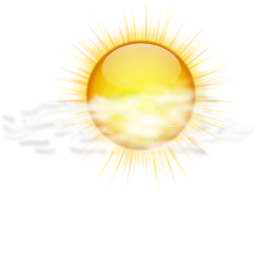 FLARE UP Solar water heaters can operate in any climate. Performance varies depending, in part, on how much solar energy is available at the site, but also on how cold the water coming into the system is. The colder the water, the more efficiently the system operates. There are basically two types of collectors: flat plate, evacuated-tube. 1) A flat plate collector, the most common type, is an insulated, weather-proofed box containing a dark absorber plate under one or more transparent or translucent covers. 2) Evacuated-tube collectors are made up of rows of parallel, transparent glass tubes. Each tube consists of a glass outer tube and an inner tube, or absorber, covered with a selective coating that absorbs solar energy well but inhibits radiative heat loss. The air is withdrawn ("evacuated") from the space between the tubes to form a vacuum, which eliminates conductive and convective heat loss. A well-insulated storage tank is an integral part of FLARE UP solar heater. Converted electric water heater tanks can also be used or the solar storage tank can be plumbed in series with the conventional water heater. In this arrangement, the solar water heater preheats water before it enters the conventional water heater. SOLAR DEVICES come to your service not only when the Sun shines but after the Sun has set also. We offer permanent solution to the perennial problem of power cuts bothering you, by converting & storing solar energy into electricity. Our state of the art Sine Wave Inverters and Charge controllers for solar photo voltaic applications, comes with the following unique features, ensures quality power supply at any time. Visual indicators for mains, inverter on, charging, and battery low. 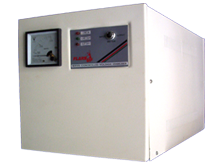 For single phase connections, stabilizers are available in capacities from 0.5 KVA to 15KVA (air cooled). For three phase connections, stabilizers are available in capacities from 3KVA to 60 KVA (air cooled) and from 60KVA to 200KVA (oil cooled). These wide range of stabilizers are used wherever sophisticated equipments which require steady constant voltage such as computer systems, computer controlled devices and plants, medical equipments, colour lab equipments, and communication equipments etc. are used. Solar Devices can manufacture their Flare Up Servo Controlled Voltage Stabilisers according to the User's specifications. Continuous correction of voltage at a speed og 35 Volts per second. Brushless AC motor for maintenance free operation. Works over wide input voltage range and no waveform distortion. Over voltage and under voltage protection. Output and input voltage LED monitor. Photovoltaics (PV) is a method of generating electrical power by converting solar radiation into direct current electricity using semiconductors that exhibit the photovoltaic effect. Photovoltaic power generation employs solar panels composed of a number of solar cells containing a photovoltaic material. 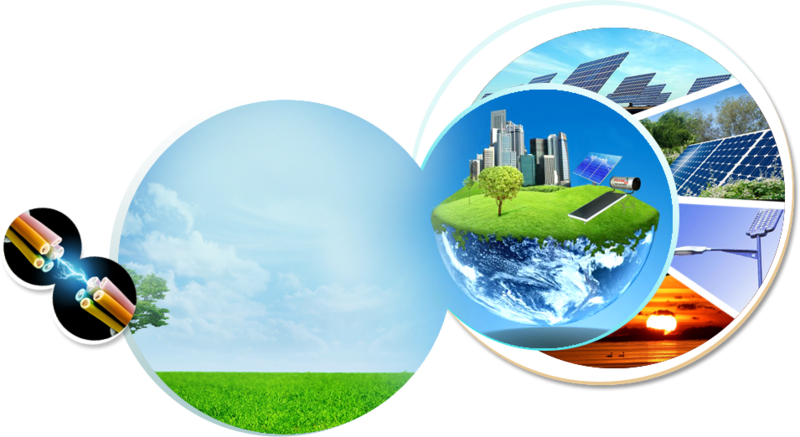 Materials presently used for photo voltaics include mono crystalline silicon, polycrystalline silicon, amorphous silicon, cadmium telluride, and copper indium gallium selenide / sulfide. Solar photovoltaics is now, after hydro and wind power, the third most important renewable energy source in terms of globally installed capacity. Installations may be ground-mounted (and sometimes integrated with farming and grazing) or built into the roof or walls of a building (either building-integrated photovoltaics or simply rooftop). Solar Devices are professionals in designing and installation of custom made and ready to use AC and DC Solar Electric Power Systems. 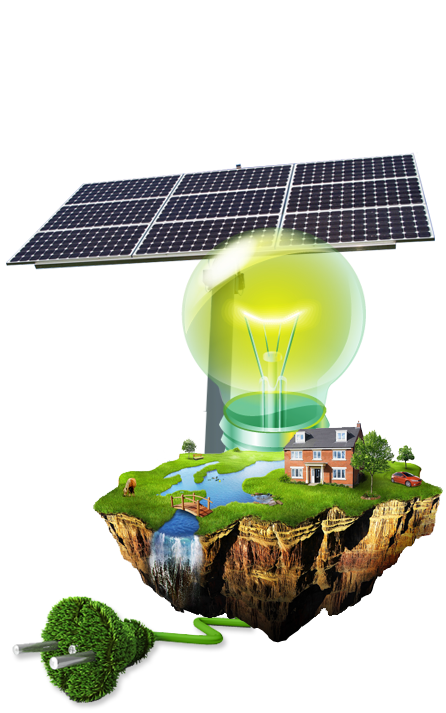 Solar Electric Power are mainly used to energies our common electric appliances in our office and home. The solar power pack consists of Solar PV modules, long life low maintenance tubular batteries, inverter , charge controller and suitable hard-ware, inter connecting cables etc. The complete power pack is ready to use anytime and anywhere.